Micrograph o a lung primary smaa cell carcinoma, a teep o carcinoma. 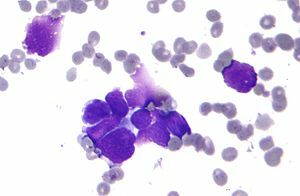 The clustered cancerous cells consist primarily o nucleus (purple); thay hae anly a scant rim o cytoplasm. The surroondin fauch stainin, discoid cells is reid bluid cells. Cytopathology specimen. Field stain. Carcinoma is a teep o cancer that develops frae epithelial cells. This page wis last eeditit on 25 Dizember 2015, at 11:56.